15 Marlborough is located on the north side of Marlborough, between Arlington and Berkeley, with 13 Marlborough to the east and 17 Marlborough to the west. 15 Marlborough was designed by architect Charles K. Kirby and built in 1863, one of four contiguous houses (9-11-13-15 Marlborough). The four houses form two pairs of mirror opposite buildings (9-11 Marlborough and 13-15 Marlborough); each pair with a single entrance porch creating a symmetrical entryway. 9-11-13-15 Marlborough were built on what were originally three lots, each with a 25 foot frontage. Charles Kirby bought the middle lot on February 24, 1863, from attorney Elias Gilbert Merwin, and the other two lots on March 9, 1863, from attorney George Otis Shattuck. He then subdivided them into three 19 foot lots and one 18 foot lot (for 15 Marlborough). The land was part of a larger parcel originally purchased from the Commonwealth of Massachusetts on November 6, 1858, by George Goss. 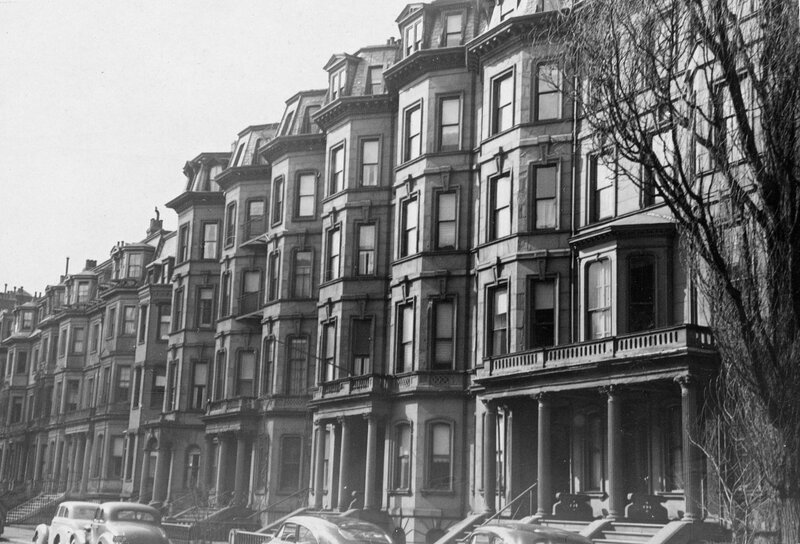 He and his partner, Norman Carmine Munson, were the contractors responsible for filling the Commonwealth’s Back Bay lands. 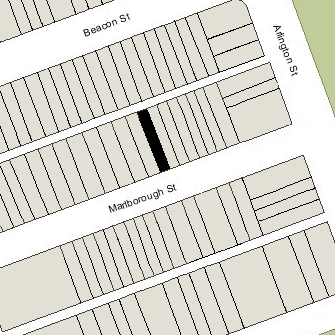 Click here for an index to the deeds for 15 Marlborough. On November 1, 1864, 15 Marlborough was purchased by Fanny E. (Thompson) French, the wife of Col. Jonas Harrod French. They previously had lived at 3 Rutland Square. Jonas French was a distiller. During the Civil War, he had served under General Benjamin Butler, rising to the rank of Colonel and serving as Provost Marshal General of Louisiana during General Butler’s controversial administration of the captured New Orleans. He was a central player in the financial irregularities which caused Butler’s removal in December of 1862. After General Butler’s departure, Col French was replaced immediately as Provost Marshall but remained as New Orleans Chief of Police until the Spring of 1863, when he resigned. In 1869, Col. French organized the Cape Ann Granite Company in association with Butler, by then a Member of Congress. They both built summer estates in the Bay View area of Gloucester, Col. French naming his Rock Lawn. From 1873, Col. French also was a director and part owner of the Maverick National Bank. The Bank would later fail, in 1891, and Col. French was among those indicted for embezzlement. The Cape Ann Granite Company subsequently went into receivership. Fanny French died in April of 1881 and 15 Marlborough was inherited by their two children, Fanny Thompson French and Henry (Harry) Gardner French. In August of 1883, Jonas French married again, to Nella Jane (Pearson) Foss, the widow of Ansel Foss. In July of that year, Jonas French had purchased a newly-built house at 128 Commonwealth to be their home. 15 Marlborough continued to be owned by Fanny T. French and Henry G. French, who leased it to others. By the 1883-1884 winter season, 15 Marlborough was the home and medical office of Dr. Charles Follen Folsom. He previously had lived at 85 Newbury. He was a physician and Secretary of the State Board of Health. Charles Folsom married in May of 1886 to Martha Tucker Washburn and they made 15 Marlborough their home. Charles Folsom died in August of 1907. Martha Folsom continued to live at 15 Marlborough during the 1907-1908 winter season. In 1908, 15 Marlborough was the home of attorney Charles Benjamin Barnes, Jr., and his wife, Josephine Lea (Low) Barnes. They previously had lived at 217 Beacon. They also maintained a home in Hingham. By 1909, they had moved to 211 Beacon. By the 1908-1909 winter season, 15 Marlborough was once again Martha Folsom’s home, but by 1910, she had moved to 114 Marlborough. 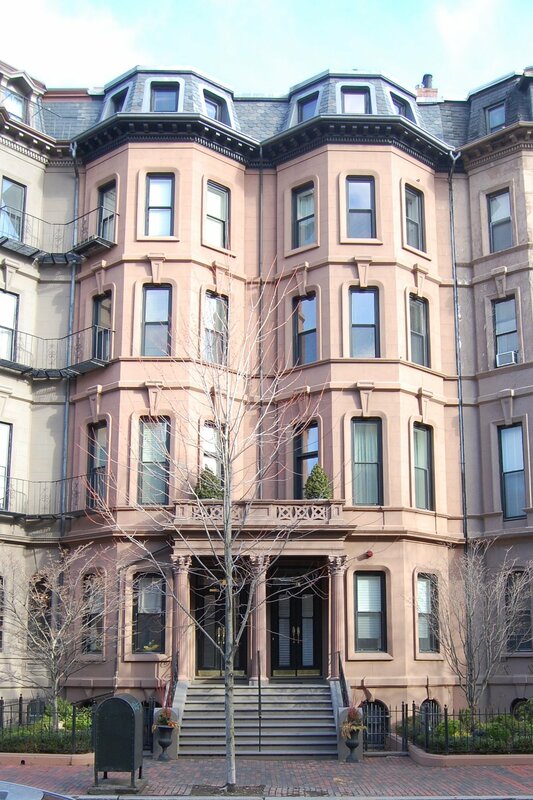 15 Marlborough was not listed in the 1910-1912 Blue Books. 15 Marlborough had remained the property of the French family. Henry G. French had died in January of 1892, and his widow, Stella (Evans) French had inherited his one-half interest in the property. She remarried in September of 1900 to Charles A. Farwell and moved to New Orleans. On January 5, 1901, she transferred her interest in 15 Marlborough to Nella (Pearson) French, Jonas French’s second wife. Fanny T. French continued to own the other one-half undivided interest. Fanny T. French died in February of 1908 and Nella (Pearson) French died in May of 1908 (Jonas French had died in February of 1903). Fanny French’s one-half interest in 15 Marlborough was inherited by her three friends, Eleanor W. Daggett, Mary Crease Sears, and Katherine A, Whitney, all unmarried. Nella French’s one-half interest was inherited by her nephews, William E. Pearson and Arthur E. Pearson, and her niece, Nella J. Pearson. On September 25, 1911, the Pearsons’ interest was acquired by real estate dealer Sherman S. Barrows. They continued to live at 15 Marlborough in January of 1920, but had moved to 192 Marlborough by the 1920-1921 winter season. On September 3, 1920, 15 Marlborough was acquired by Gertrude A. (Long) Rich, the wife of Charles Johnson Rich. Their daughter, Phyllis, lived with them. They previously had lived at 33 Bay State Road. Charles Rich had been owner and theatrical manager of the Hollis Street Theatre. He died in May of 1921. Gertrude and Phyllis Rich continued to live at 15 Marlborough. Phyllis Rich married in October of 1924 to Robert Ballantine Bradley, president of the Hans Hinrichs Corporation, chemical manufacturers. After their marriage, they lived in New York City. Gertrude Rich was living elsewhere during the 1924-1925 winter season and 15 Marlborough was the home of attorney Henry Morse Channing and his wife, Katharine (Minot) Channing. They also maintained a home in Sherborn. They had lived at 142 Marlborough during the previous season and resumed living there during the 1925-1926 season. By the 1925-1926 winter season, Getrude Rich was living at 15 Marlborough again. She continued to live there until her death in November of 1928. The house was shown as vacant in the 1930-1934 City Directories and was not listed in the Lists for residents for 1930-1934. In 1935, 15 Marlborough was the home of Mrs. Winifred (England) Ruiter, the widow of Robert E. Ruiter, and their adult children, Frances Ruiter, Florence E. Ruiter, Byron E. Ruiter, and Robert G. Ruiter. They operated it as a lodging house. They had lived at 22 Marlborough in 1934, and by 1936 had moved to 81 Mt. Vernon. The house was shown as vacant in the 1936 and 1937 City Directories and was not listed in the 1936 and 1937 Lists of Residents. On April 10, 1937, 15 Marlborough was acquired by Fannie I. (Itzkowitz/Asquith) Lang, the wife of Clarence Edward Lang, and Sally Dinn, the husband of Fannie Lang’s sister, Jennie Augusta (Itzkowitz/Asquith) Dinn. They all lived in Winthrop. 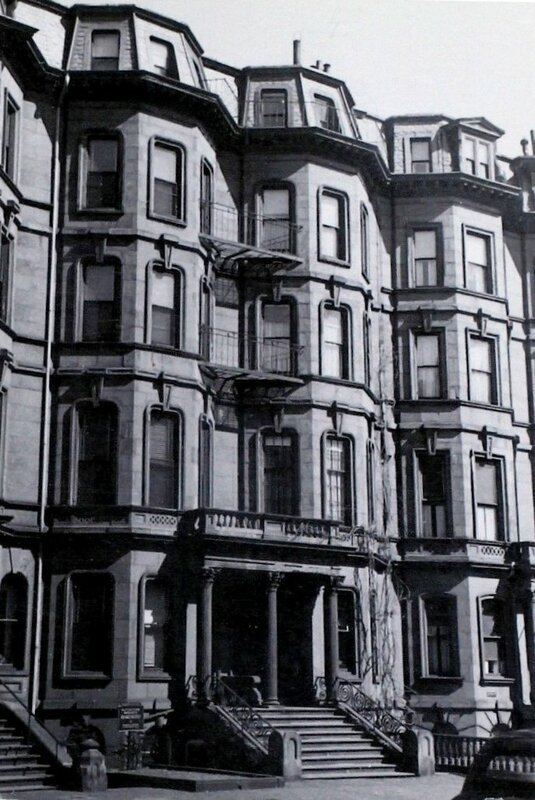 Clarence Lang was a real estate dealer and Fannie Lang operated the Fannette Gown Shop at 85 Newbury. The Dinns had recently lived in Germany. They operated the property as a multiple dwelling, either apartments or a lodging house. In 1940, Fannie Lang entered into an oral agreement to sell 15 Marlborough to Marie Antoinette (Giraudo) Monks, the widow of Allen Bradford Monks, who had died in 1938 in California. Mrs. Lang agreed to transfer the property to Mrs. Monks without payment, with the understanding that Mrs. Monks would obtain the funds from her attorney, Herbert S. Avery, from trust funds of her late husband. The title was recorded on June 10, 1940, but the funds were not available (Mrs. Monks’s entitlement to them having been denied through previous litigation). Mrs. Lang successfully brought suit to recover ownership of 15 Marlborough and the property was recorded in her name on July 29, 1942. On October 9, 1942, Fannie Lang transferred the property to herself as trustee of the F. G. S. Real Estate Trust. On June 28, 1955, 15 Marlborough was acquired by Elizabeth Krauss. She lived at 141 Beacon, where she operated a lodging house. The property changed hands and on February 12, 1979, was acquired by Charles C. Patsos, trustee of the Marlboro Associated Trust. In October of 1978, he had purchased 13 Marlborough. In August of 1995, he filed for (and subsequently received) permission to convert each house into twelve apartments. On June 5, 2002, 13-15 Marlborough were purchased from Charles Patsos by the Marlborough Street Acquisition 2002 LLC (Sean P. McGrath, manager). In April of 2003, it filed for (and subsequently received) permission to combine the two houses into one property and remodel the combined property into six apartments. 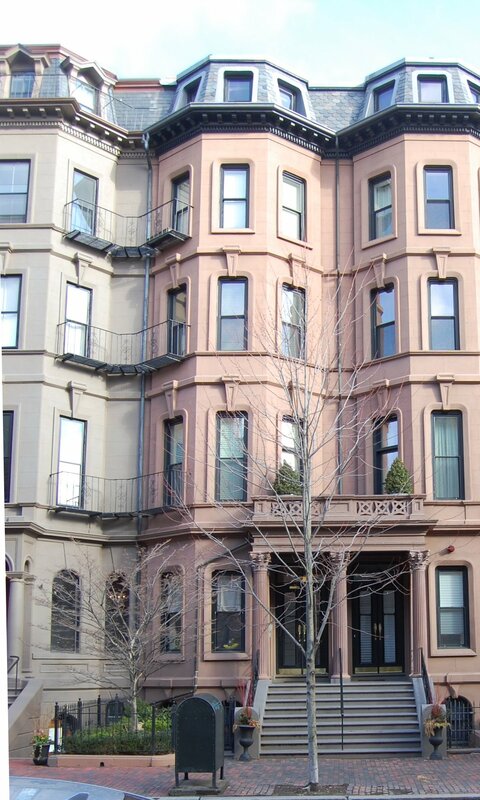 On April 28, 2004. the Marlborough Street Acquisition 2002 LLC converted 13-15 Marlborough into six condominium units, the 15 Marlborough Street Condominium.